Taxonomy: Coral Banded Shrimp belongs to the Kingdom Animalia, Phylum Arthropoda, Class Crustacea, Order Decapoda, Family Stenopodidae, Genus Stenopus and Species hispidus. Scientific names: The scientific name of Coral Banded Shrimp is Stenopus hispidus. Other common names: Coral Banded Shrimp is also known as Banded Prawn, Banded Coral Shrimp, Barberpole Shrimp and Banded Boxer Shrimp. Origin or natural range: Stenopus hispidus originates in the tropical Indo-Pacific region and the Western Atlantic Ocean. Size: Coral Banded Shrimp grows up to a length of around four inches. The female Coral Banded Shrimps are double in size to that of their male counterparts. Compatibility: Stenopus hispidus is semi-aggressive towards the other marine aquarium members. Coral Banded Shrimp lives for around two to three years or more. Stenopus hispidus is found hanging upside down on coral reefs, in rock crevices and shells. Coral Banded Shrimp cleans the fish body off all the parasites, plankton and the other organic decaying matter. Stenopus hispidus is nocturnal in nature and therefore, becomes active at night while hiding away in caves or overhangs during the day time. Coral Banded Shrimp has its body bristles for its defense and uses its tail to back out briskly. Stenopus hispidus has the capacity to regenerate its lost limbs during molting. Coral Banded Shrimp is quite hardy but is not a true shrimp. The body and the legs of Stenopus hispidus have red and white bands on them. Coral Banded Shrimp has long and white antennae and a tail. The pinchers of Stenopus hispidus are quite large, especially those of the third pair of legs. Female Coral Banded Shrimp has visible blue colored ovaries. Temperature of water: Seventy-two to eighty degrees Fahrenheit or twenty-four to twenty-seven degrees Celsius. Specific gravity of water: 1.022 to 1.025.
pH of water: 8.00 to 8.40. To host Coral Banded Shrimp, you should have a fish only marine aquarium with a minimum water capacity of thirty Gallons and having rocks and vegetation in it. Keep only one Stenopus hispidus or a mating pair of it at the bottom of a marine aquarium, as the shrimp is quite aggressive towards the other members of its own species. Give ample space to Coral Banded Shrimp to move around in your marine aquarium. Gradually acclimate Stenopus hispidus to your marine aquarium. Approximately one hour of slow acclimation is recommended. Feeding & Nutrition: Coral Banded Shrimp is Omnivorous in its feeding habit and eats Polychaete Worms, vegetable flakes and frozen meaty bits. Stenopus hispidus is also a scavenger and eats detritus. Breeding: Coral Banded Shrimp does not readily breed in captivity and even if it does, the resulting larvae are eaten by other marine aquarium members or may get sucked in by the aquarium filter system. Stenopus hispidus eats away all the unnecessary objects attached to the surface of fish including parasites, detritus, etc. Coral Banded Shrimp is the safest and the most effective method of cleaning the fish off parasites. Using medication as an alternative method may prove harmful for the corals in your marine aquarium. Stenopus hispidus is a scavenger and eats detritus thereby, cleaning your tank off any perishable organic matter that would otherwise contaminate the water in it. Coral Banded Shrimp is easy to maintain owing to its non-poisonous nature and is recommended for beginner aquarists. Do not keep Stenopus hispidus with large predator fish such as Trigger Fish, Eel, Lion Fish, Trappers, Groupers, Wrasses etc., as the shrimp may become the food of these fish. Add Iodine to the water as dietary supplement for Coral Banded Shrimp to smoothen up its molting process. Before introducing any chemical or medication in your marine aquarium, find out if it is safe for Stenopus hispidus else, the chemicals may prove lethal for the shrimp. Caution: Coral Banded Shrimp may attack shrimps, worms, hermit crabs, anemones, corals, snails and other Crustaceans present in the marine aquarium. 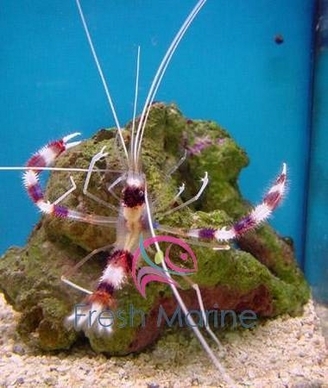 Therefore, do not keep Coral Banded Shrimp into reef type marine aquarium.